There is nothing more intimidating than taking on big challenges by yourself. I remember when I first went to college – I was a 17-year-old girl a thousand miles from home with no friends, no family, and no set community. I quickly discovered that if I wanted to enjoy my college years, I was going to need to find a group of people that understood what I was going through while not taking away from my studies. I think sometimes students tend to do too much of one or the other. For some, college is all about partying and making as many friends as possible, but others prefer spending hours upon end in the library just to prepare for next week’s upcoming exams. As a college student, you’re going to have a lot of tough situations thrown at you. Take for instance a week when you have three tests or papers due. Somehow, this week seems to happen at least once every school year and you often find yourself overwhelmed and on the verge of tears as you stare at everything that needs to get done. Although cramming as much information as you can into such a short amount of time might seem like the best route, what does that get you? Talk about feeling like a hot mess! Rather than pushing yourself to this point, I highly recommend planning in at least some time for community. This could be taking part in a yoga class with other students who understand your struggles, taking a study break with some friends from your classes that might be up for a group study session later, or an online community through Facebook, like the Sunflower Circle. What is the Sunflower Circle? The Sunflower Circle is a Facebook group for college students who want support in living a healthier and happier lifestyle. In the group, you’ll find themed discussion threads that encourage self-reflection and positive mindset prompts, both of which are perfect if you’re feeling completely lost, stressed out, and alone in not just college, but in your life journey. The Sunflower Circle part of a larger project, called the Sunflower Project, that focuses on the positive things in life through gratitude challenges and community. Started by Sara Laughed, this project using positivity, balance, and self-care to take you closer to your goals and dreams! The best news? It’s absolutely free and you can join the Facebook group RIGHT NOW. Even though I’ve graduated college, I’ve found this community to be so helpful in terms of getting my mind in the right place for work. Also, it allows me to share my experiences with others who are going through the same things that I did. 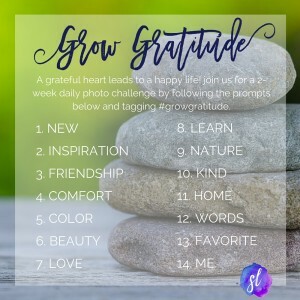 In addition to the Facebook group, a #GrowGratitude Instagram challenge is taking place! Feel free to check out the daily prompts and post pictures of something you’re grateful for. If you have found yourself struggling to make meaningful relationships, take some time to think about what interests you. Then, see if there is a club or organization on campus that you could join. Try branching out to your local area and see if there are weekly meetings or classes somewhere. If you prefer to stay on school grounds but don’t want to officially join a club, make an effort to talk to some of your classmates and see if they would be interested in doing a study group sometime. You could also pop into the library randomly and connect with students there, or take part in a fitness class that you’ve never attended. With so many other students around, there’s bound to be a place where you fit in! One thing I learned about myself early on in college was that I needed at least a few people that I could call, talk to, or get advice from when I was feeling down. I felt so much better when I could connect with someone and just vent out all of my frustrations. For me, this was one way that I practiced self-care. Even if you are more of an introvert, I’m sure you still feel better when you have people you can rely on. We all have that desire in us to be accepted and wanted by others, and that’s why community is so important! I want you to go out and find a community that lifts you up and inspires you to do better each and every day. Remember, you are always welcome in the Sunflower Circle! It’s a no-judgment zone with tons of support and inspiration. When I first started I just studied by myself for ages. I realised when I started making friends that I enjoyed going to university much more and studying with people is way more fun!